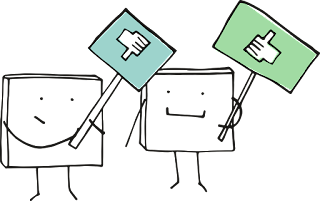 The #OpenBlog19 challenge created by David Hopkins is sparking a series of posts where educators go on to challenge others to write a blog in answer to a given question. Steve Wheeler challenged me to write about 'What's wrong with education'. My initial thought was that I would have much preferred talking about what is good with education! 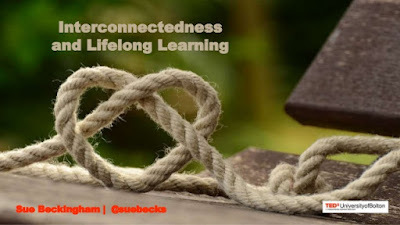 There are so many good examples I'd love to share from the many educators I connect with online through Twitter, that have openly shared with others how they engage their students; how they co-learn together; and how they experiment with innovative and creative approaches using Lego, social media, digital technology, post-its, role play and so much more. So back to the question. I'm not the kind of person that can just list what is wrong, as I have the strong desire to consider what we can do about it. I know I may not have all the answers and therefore I think it is so important that we discuss any such issues with our peers and in this context also with our students. So with that said I will still offer a few of my own observations. I think we need to consider more ways in which we create situations where students can apply their learning, re-visit this through reflection and feedback and then have opportunities to re-apply an enhanced version of their learning. There are many examples where students work on authentic projects with a purposeful outcome. When these involve real-life situations to investigate, analyse or solve, this is where I see the sparks and enthusiasm. reconsider how we can encourage curiosity, intrigue, excitement, the desire to question, and the confidence to critically challenge. We know that there are educators who continue to teach as they experienced 'being in the classroom' and this is not always a good thing. That's not to say that what may be called traditional approaches don't equate to a positive learning experience. For example there are many great examples of the lecture being an incredibly engaging experience, but we also know having being on the receiving end of being talked at, that we can quickly disengage. Why would it be different for our students? Going to educational conferences, seminars or workshops within or beyond your university, college or school has for many provided great inspiration to enhance practice. When we can hear from peers about innovative practice that is evidenced as being valued by learners, it provides inspiration to re-look at our own practice. It's important to to have those discussions about new interventions that haven't worked too. However CPD budgets are being cut and sadly in some cases becoming non existent. It is important that we look for other ways to learn from peers. As already mentioned this is happening across the globe where educators have appropriated social media and digital technology to connect, communicate and collaborate. For me everyday is a learning day and I am constantly learning from peers. As educators we need to fire our enthusiasm for professional development and take responsibility for this. Equally I would argue that this needs to be recognised as well as encouraged by senior leadership in our institutions. I am sure you will have come across the quotes below in some form or another. These apply to everyone one of us and not just the students we teach. As educators we need to lead by example and embrace lifelong learning. We need to reflect on how we teach and get feedback on how we teach; observe how others teach and learn about new ways to enhance our own teaching. We need to trust and value those of our peers who have roles for example as educational developers, learning technologists, learning developers, librarians. Professional development needs to be embedded in our practice and time allocated to do this, but not as the odd bolt on. CPD is what is says on the tin - continuous professional development. This is an extract from a paper titled the 'Purpose of Learning' by Martin Luther King Jr. in 1947. I think it may suffice to say that we all need to reflect on and learn from history. Most of the "brethren" think that education should equip them with the proper instruments of exploitation so that they can forever trample over the masses. Still others think that education should furnish them with noble ends rather than means to an end. For those that know me, you will know that for some years now I have been an advocate of the use of social media for learning and teaching. It has provided opportunities for my own CPD that continue to go beyond my expectations. The generosity of the communities I engage with or indeed listen in to, have had such a postive impact on who I am as a professional and the work that I do. #SocMedHE18 is the conference hashtag this post is about. I have been incredibly lucky to be able to co-create, co-organise and contribute as a co-presenter at an event that brings so many wonderful people together to openly share, discuss and debate topics around social media for learning. So this year Rachel Challen from Nottinham Trent Uni picked up the baton and agreed to host the 4th Social Media for Learning in HE Conference. Rach made the decision to reach out to her network to look for volunteers to form the organising committee for #SocMedHE18 and I was thrilled to be asked to join her team. Her approach to leading this massive undertaking must be commended. Using social media - mostly Google Drive and a private Twitter DM group, with the odd Zoom and Skype meeting - Rachel encouraged everyone to contribute ideas. The creativity that came from this group was fantastic and the unique additional touches Rachel added were brilliant. Right at that start she involved Bryan Mathers from Visual Thinkery to help the team develop ideas for the conference themes and to help Bryan create a collection of visuals that could be made into stickers (which were gifts for delegates at the event). He also created an Inclusive Revolution remixer which was great fun to use - try it yourself. The whole process was an incredible experience. From start to finish Rachel made sure everyone had a part to play and inspired everyone to contribute. Meanwhile behind the scenes she worked with her wonderful NTU team to make the magic that pulls a conference together. The themes for the event were openness, digital identity and creativity. Deb Baff came up with the ingenious idea to ask people to tweet their proposal to make it inclusive for all to contribute something short (in 280 characters!). 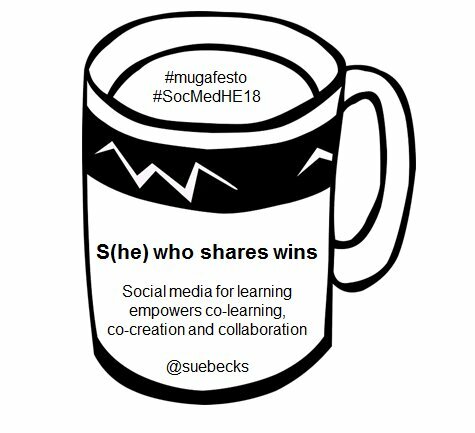 A great response was received and the conversation using the #SocMedHE18 hashtag was on fire right from the start! To be honest the conversation has been vibrant leading up to, during and post conference. The event included activities that enabled those who could not be there to engage. Livestreaming the keynote is one example and then there was the Mugafesto. #Mugafesto was an idea created by Andrew Middleton to develop a manifesto that could fit on a mug. Statements that could help others see why social media for learning in HE is important and something that should be supported and encouraged. See my contribition at the top of this post - my intention being to highlight the value of open sharing to encourage the making of new connections, conversations and collaborations. The more we do this, the more we can gain. The more we gain and learn through trusted networks, has to be a win win situation. Maren refered to social media as powerful, personal and pervasive. It is easy to get carried away with the positive outcomes of using social media, but we also need to be mindful of the dark side. Having these conversations with family, friends, colleagues and students has never been so important. The day continued with three sets of parallel sessions. Choosing was always going to be difficult but in a way was made easier for me as I was asked to chair three sessions in the first set and was presenting a workshop in the final set. Given the Twitter feedback all sessions brought their unique value to the day. I certainly got a great deal from all the sessions I attended. Hearing from educators sharing their practice and being able to discuss not just what went well, but also what didn't go as planned is incredibly valuable. Providing a forum to question, discuss and offer similar experiencs or suggestions is such a helpful approach and for me the bedrock of successful CPD. Every session allowed for this and I have come away with new ideas and ways I can re-consider my own practice of using social media for learning and how to (re)evaluate it. We explored in a session what we feel it means to 'lurk' (or what I prefer to refer to as positive silent engagement), where not participating is very often because the individual is shy or just not ready to contribute immediately (if at all). I want to think more about how I can encourage and help those that want to 'cross the bridge' but also recognise that I must acknowledge others may gain as much as they wish to by just listening in. During this session I co-led with Sarah Honeychurch, Neil Withnell and Scott Turner, I was momentarily worried people were not enjoying it, mistaking the quietness. Sometimes we need quiet for thinking space. Some people may need more time to think than others. Secondly I wanted to mention the joy and happiness of the many first 'face to face' meetings that took place. Many selfies were posted at the start of the day! I met people I regard as friends as we have known and interacted with each other through social media for some time, yet never met in person. I'm sorry I can't mention everyone but it was a joy to meet you all. I do want to mention Hala Mansour as our friendship is deeply rooted having shared a #WOL (working out loud) experience; and also Jenny Lewin-Jones and Kiu Sum who have both been part of the LTHEchat organising team; plus Teresa MacKinnon who I've had the pleasure of meeting many times off and online but would love to see more of! I find it fascinating to observe how the use of emojis, GIFs and bitmojis can add visual cues that maybe don't make up for the face to face experience of communicating but certainly help us express emotions and facets of our digital selves! From the start of the day the 'build your own badge' table had everyone smiling as they happily added their own creative stamp whilst making their perosnal name badge. Andrew as afore mentioned used his creativity to create a video to introduce the #Mugafesto activity, and Bryan who made the best stickers were both brilliant; but then each and every presenter also brought a range of creativity to the way they have enhanced their practice, shared research undertaken or ongoing, and in the way they stimulated discussion around one or more of the three themes. Rachel of course has used her creative wand numerous times and made this such a special event. Thank you for making it happen. I really didn't want the day to end. The good (actually brilliant) news is that SocMedHE19 will take place on December 19th at Edge Hill University led by the wonderful Dawne and Sarah. If I can leave you with one bit of advice, it would be follow @SocMedHE and make sure you get yourself to #SocMedHE19! The recording of the TEDx talk I gave at the University of Bolton is now up on the TEDx YouTube channel! Below is the tweet that let me know. The event included 12 presenters so hats off to the team who filmed and edited all of the videos. #Learning is a relationship between many different aspects of one’s life. My #TEDx talk was about the potential of interconnectedness and open lifelong learning may be the key to finding ikigai - your purpose, your reason for being - and the key to a happier and longer life. Below are background slides that could be seen on the big screen at the event. #SocMedHE17 Social media for Learning in Higher Education Conference. The third Social Media for Learning Conference took place once again at Sheffield Hallam. I was thrilled to have five of my students contribute to the event, their work on SMASH - Social Media for Academic Studies at Hallam. The morning of the conference was designed as a Build Your Own Conference approach whereby delegates suggested and voted up activities. These ranged from conversations, feedback on research to full hands on workshops. It was a brilliant start to the event. In the afternoon there was a collection of workshops, short papers and poster presentations in parallel sessions. I can hand on heart say this is one of my favourite events, bringing together old friends too many of you to mention all by name but you know who you are) and an opportunity to meet new people sharing the same interest of using social media to enhance learning and teaching. It was great to see Jenny and Scott who have been part of the LTHEchat organising team over the last few months as this was the first time we'd met face to face! The student founders and new members of SMASH led a session in the morning and used the opportunity to get feedback on their 7 ways to use [social media tool] cards. These were Corran Wood, Jess Paddon, Abby Butler, Callum Rooney and virtually Matty Trueman (who was recovering from appendicitis so couldn't be with us in person) They received some great feedback both in the session and through Twitter. In the new year they will develop these resources further and plan to run workshops with staff and students at Sheffield Hallam to demonstrate the different ways social media can enhance learning and teaching. The resources will be given a Creative Commons licence and then shared through a new blog and Twitter account. I like this Sue, will these resources be shared via the #SocMedHE17 hashtag or somewhere (creative commons attributed etc?)... would like to see how useful they would be to @UEL_News staff. At SHU, staff that I'm taught by have used nearly all the tools at a basic level but there are so many other ways to develop learning with students using these tools and apps. Personally I've not used WhatsApp within learning as of yet (I hope that answers your question)! I attended a great session led by Suzanne Faulkner, which as it happens so did my students. I've been a bit of skeptical about using Snapchat but now encouraged by Jess, I will definitely look into this in the new year! Together with Suzanne Faulkner we ran a fun workshop using Lego to get participants discussing their online identity. I wish now we'd been able to record this as there were some great discussions, and volunteers who described their models. It was also good teaming up with @JennyLewinJones during the session - playing LEGO with others is always more. Corran Wood and Jess Paddon, two of the four founder members of SMASH led a presentation on how the group started and what they had gained from the experience. I co-presented a paper with Simon Horrocks on Social Media and Higher Education Digital Leadership. Whilst our research is work in progress, it gave us an opportunity to seek valuable feedback from the attendees and gauge interest in the work we are doing. Watch this space for how this research develops. Interesting talk on #HEDigitalLeadership by @horrocks_simon @suebecks - Sue is an excellent example of digital leadership, helping us to start our #shuSMASH project! The final session of the day gave me the opportunity to attend Neil Withnell and Emma Gillaspy's excellent workshop 'Cracking the TEF crystal maze – technology edition'. This was a series of activities or challenges that we had to solve in small groups. Each gave us the opportunity to test out different platforms whilst trying to crack the clues. It's certainly inspired me to try something similar with my own students. It was a non stop day but a very enjoyable one. As you might imagine there was much to tweet about. So many engaged with the event that were not actually physically present which was great. The 1st October has to go down as one of my proudest personal moments. I travelled down to London with my husband to attend the National Teaching Fellow Award Ceremony which took place at Church House, Westminster. It was wonderful to share this event with Prof Sally Brown, a friend and colleague who has inspired me for many years. We enjoyed a wonderful meal and then came the time to collect our awards. Thanks David for capturing this photo! 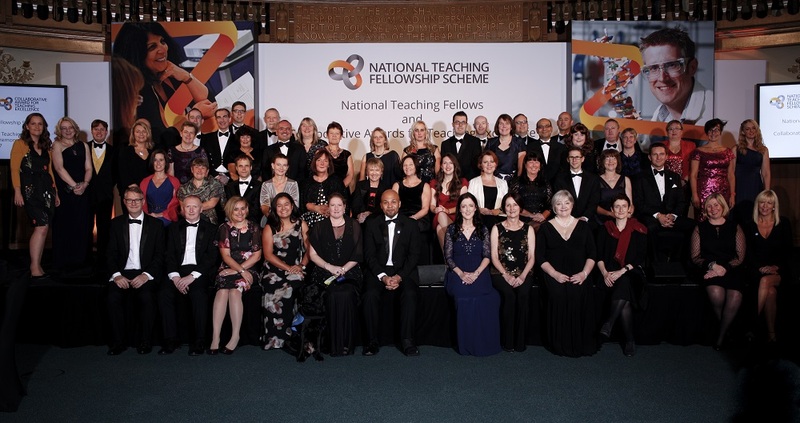 David Smith and Kim Bower, colleagues from Sheffield Hallam were also receiving NTF awards. This was the photo captured by Graham Holden. On stage I was given my official certificate. 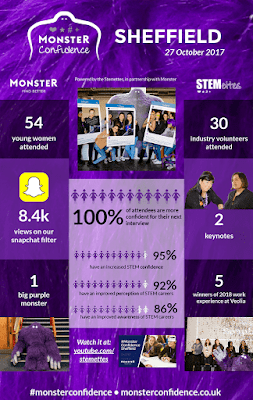 I was delighted to be invited by Anne-Marie Imafidon to give one of the keynotes at the Stemettes #MonsterConfidence Conference in Sheffield. The event is aimed at girls interested in STEM and co-run with Monster, a leading job site in the UK. Anne-Marie is the CEO of the Stemettes and she can be found on Twitter as @aimafidon. Amongst other awards, Anne-Marie was recently announced by Computer Weekly as one of the most influential women in the UK. My keynote focused on the importance of networking and building an online presence. I wanted to encourage the girls attended to learn to use social media in a professional context to connect, communicate, curate, collaborate and create. Drawing on the work of Stepper, I expounded on the value of working out loud and sharing achievements so that others can learn from these experiences. Ultimately I wanted to help them see the value in building networks online through the use of social media. It was a fabulous event and I took great pleasure in being involved throughout the day. This included 'speed dating' sessions where the student attendees spoke to myself and others to ask questions and learn about how we had developed our careers.